Here's an authentic recipe of Pancit Molo, as shared by a fan of PinoyAmericanFavoriteRecipes on Facebook, Reiza Panes, from Iloilo. Iloilo a well-know district in the province. Unlike other pancit, Pancit Molo is not dry but soupy and it does not make use of long, thin noodles but instead wonton wrappers made from rice flour. Leftover wonton wrappers can also be cut into strips and drop into the hot broth. dumpling resembles a flower. (The filled portion should be in the center.) Cover the dumplings with a dry kitchen towel and set aside. To make broth: – Saute onion and garlic in oil until light brown. Add chicken stock and the remaining salt and patis from the filling. Allow to boil, the drop the stuffed dumplings into the boiling broth.Stir the remaing meat mixture into the broth. Simmer for 10-15 minutes.Season with pepper to taste. Before serving, garnish with chopped spring onions (or kusay, a greens leaves most likely like green onions, but flat), and chopped celery. More often we put evaporated milk after it's out from the stove to make it real creamy and taste good. Note: My mom had to make her own wonton wrappers before, because if you buy in the supermarket they put preservative and sometimes it's too frozen and it cracks once fold and not smelling good. Pancit Molo is one who should not miss to try when you go to Iloilo, especially the one right in Molo district. ...........Yes this is truly the best especially if you make your own wonton wrappers ... but for me before i put my "molo ball" to the soup i have to steam it first for a few minutes just to half-cook the fillings inside. Set aside, put in a wax paper to let it dry for a while. Once my soup is cooked and done i place my molo balls to it, but dont stir so much in order not to break the balls. Take out from the stove and add evaporated milk ... garnish it with chop celery stalks and a little of green onion leaves, top it with unpeeled shrimps, a little of shredded chicken breast ... and nice if you sprinkle it with toasted garlic to smell good. It's fantastic! 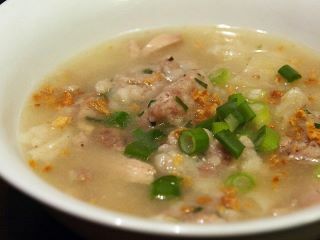 Here's the Pancit Molo made by Alma, a reader of this blog. She posted this picture on her FaceBook page....see her comment below on the comment box. Mmmmm, Yum-O! !